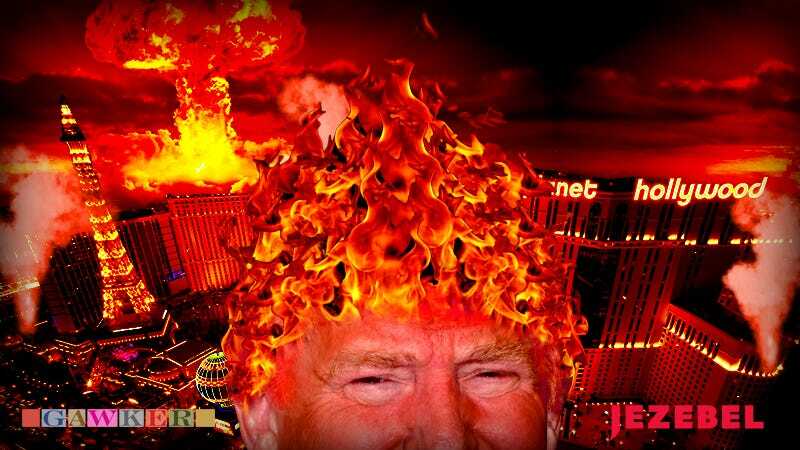 Hellfire, Damnation & Donald: Welcome to Your Republican Debate Liveblog! On the occasion of the year’s 33,000th and final Republican debate, we at Jezebel thought we’d conjure up something special. No not a demonic entity sent to rain down hellfire and put us out of this misery (unfortunately), but a very special joint liveblog experience in which Gawker will join Jezebel for the ultimate soundclash/showdown/three-hour-long group therapy session. Questions hopefully answered on tonight’s stage in Vegas will include: Is Ben Carson gonna drop some more knowledge bombs? Can Ted Cruz move his body in any fashion aside from at 90-degree angles? Will Trump’s head explode because of embolic pressure? Will Kasich’s head explode because of Trump? Will our heads explode because of Carson and Cruz and Trump and Kasich? Also, who’s Jeb? Where’s Carly? Why’s Rubio? And like, what’s Wolf Blitzer gonna wear? Join us all goddamned (LITERALLY) night in this Gawker vs. Jezebel meeting of the minds, temperaments, and wines. Peace be with you! Trump photo via AP. Vegas photo via Shutterstock. Art by Bobby Finger.